Copyright 2010 CAIS. All Rights Reserved is the owner of the copyright for this website. In total 9 links were found which refer to Caisca.org. 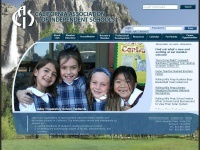 The most used keywords in text links are California Association Independent Schools and California. The most important link sources for this website are Efsd.org and Chaschool.org. The homepage of Caisca.org and the subsite are most referenced by other websites. The table shows the most important links to Caisca.org. The table is sorted in descending order by importance. The table shows websites of Caisca.org, which are often linked by other websites and therefore they are classified as important content. The web server used by Caisca.org is located near the city of Allentown, USA and is run by Creative and Logical Solutions, Inc.. The website Caisca.org has a own web server. The web server only runs this website. The websites of Caisca.org are hosted by a Microsoft-IIS server and were developed in the programming language ASP.NET. The markup language of the website is HTML 4.01 Transitional. The homepage of the website is "/page/2242_Home.asp". Server provider: Creative and Logical Solutions, Inc.